Two dates. Eventually, all of us will experience them. The first is the day we’re born. The second is the day we’ll die. Two dates. One of the things that came out in our sessions is that, based upon negative/bad experiences (things I did/things done to me/things that happened to others,) we formulate ideas, thoughts, & beliefs that are honest (truly what we think, feel, & believe,) but that aren’t based on truth (a.k.a. what God says, what He declares is true of me & my identity.) These beliefs can & do shape our attitudes, thoughts, & behaviors, often in very negative & painful ways. One of those that has once again emerged, (& that I have been fortunate to have people wrestle through with me over the years,) is the belief that I am inadequate, insufficient, & wholly lacking in the areas I need for life, for relationships, for my ‘job.’ This belief does not have a strong hold on my life — due in large part to the many hours of theophostic prayer with Dennis & Georgia, hours of counseling & talks with Chuck, God’s boundless goodness & grace in revealing to me, through His word, through our ‘talks’ what He thinks of me, & finally through dear friendships full of good words & forgiveness. Still, during the intensive – as I tracked negative experiences on yellow post-it notes (I will forever associate negative feelings with yellow post-its… so say we all) – I saw this consistent theme of inadequacy & insufficiency surface repeatedly… it got to the point that, as I looked at my years from a birds-eye view, I saw the thread linking them together, a diabolical, dehumanizing thread meant to put me into a shell, consumed with self-doubt & loathing, bound by fear, too timid to DO anything for fear of being discovered for what I was. Not enough. I saw that thread & it pissed me off. Made me angry at the time I spent dwelling on those negative thoughts. Angry at the damage done TO me & BY me as a result of those beliefs. But most of all, angry at the enemy of my soul, enemy of OUR souls, the one who strikes at us, who looks to keep us from the saving grace of God through Christ if he can, & if he can’t, he’s the one who looks to steal from us, kill us off slowly, & methodically destroy every area of our lives. I know why I feel responsible for Johnny, (not to mention Joel & Ben;) its because I’m the oldest. The firstborn. I took on the responsibility when I was 4, & somewhere in there a parental encouragement of “Watch over your brothers while I go to the store,” became something never intended: You, Louie, are the one who is responsible to make sure that nothing bad happens to your brothers. And if it does, its because you somehow failed. Or you were inadequate. Or you should have done something better. Or different. Or both. See what I mean about a crushing weight? When my parents brought Johnny home from UCSF, I was unaware that he was coming home to die, & would die soon, apart from a miracle healing from God. How was I unaware? Well, if you work hard, don’t ask questions, & pretend that life is really normal & nothing bad is happening, & your brother is in San Francisco for treatment but he’s really getting better, & then he’ll come home & life will resume, it’s really pretty easy. Until I saw him. He was laying in his hospital bed, downstairs at my parents house. His abdomen was distended, & I didn’t know why. So I asked. And he told me, “It’s my liver.” And then I knew. I noticed the yellowish tint to his eyes, his skin. The general overall weakness of his countenance. How much weight he had lost. And then I knew. And the previous 12 months of denial reproached me like a slap to the face. I had avoided the reality of the situation because it hurt to much to acknowledge it. I wish I’d spent more time talking with Johnny through his months of treatment, because the conversations I did have are some of the most precious memories I have. Because in the middle of the sickness, the pain, the suffering… my brother found a depth of faith & trust in God, something I can only call true maturity in Christ. I’m thankful for my mom recording & writing down some of the conversations she had with him too. Because they provide an insight to what really matters. Here’s what I mean: Instead of getting bitter or angry at God about his short life, the cancer, & all the things he’d lost or wouldn’t get to experience, he fully embraced what he HAD. His life. And his life’s purpose – to live for the glory of God, in the middle of WHATEVER circumstances he faced. In the face of death, in the midst of pain, he lived & died for that purpose. To have that kind of resolve, that kind of outlook on life, that kind of focus is something that motivates & inspires me every single day. He lived a good story, the kind of story that makes me want to be a better man. Two dates. My first one is September 19, 1969. And my second one? Don’t know. But I can tell you this. I will live & strive to live for the glory of God in every area of my life. To live a good story. To be the best husband, father, grandfather, son, & friend that I can be. Because when I do that, I’m honoring Johnny & God. One of my favorite things at this phase of life is getting together with my family – my kids, their spouses/fiance’ & families – for a meal. Being able to gather in one of our houses for a couple hours of good talks, laughter, fun, & of course food. This last Saturday we got together at Joey & Grace’s place for an early dinner – tacos. It was a little surreal for theBean & me as we brought drinks & let the rest of the family take care of the cooking. And goodness! Those Locke girls are really great cooks! I could get used to this. Upon our arrival, we discovered that the girls had planned a surprise for us – not only were we going to eat great food… it was a gender-reveal party for Johnny & Joelle’s little 22-weeks-along-or-so biscuit… our grandbaby. They were really creative in how they set up the living room/kitchen… there was a white board where everyone not in the know could place their vote (Mister or Miss)… pink & blue balloons abounded… as did white-chocolate covered pink & blue popcorn… Nuts or No-Nuts M&M’s… lots of fun. And then it was time to find out… a closed box full of chocolate strawberries was produced & Joelle teased the moment just long enough for my emotions to kick-in & my eyes to get misty… & then she popped the lid… IT’S A BOY! They’re having a boy. Which means grandson #3 for us. We couldn’t be happier. Up until I was about 30 years old, I would have had a difficult time identifying the majority of emotions I felt. Mostly I cultivated a stoic, Spock-like (or Lt. Data, pre-emotion chip, for you TNG fans,) visage to cope with the overflowing cauldron of unidentified, powerful, & often incapacitating feelings swirling around somewhere near where I’d identify the location of my guts. Sorting through faded memories I remember some of my early life’s painful things: being bullied… I was a pretty small kid who turned his L’s & R’s into W’s, which made me the target of a handful of boys (& one 5th grade girl) at ages 5 & 6. Being mocked for wearing Toughskins jeans sized “Husky” (which evidently got translated as “Fat” by my 3rd grade class). Being picked last for sports. Abuse at the hands of a relative. Being told in 6th grade I didn’t have a good voice for public speaking (I had had to do a speech for reading class & after I finished my ‘helpful’ teacher was evidently trying to point me away from a career path where I’d have to talk in public…) The list goes on. I also remember GOOD memories. Positive things. Finding out I was going to be a big brother, 3x/over. Excelling in school. Making a real friend who would stand with me. Parents who worked long hours at multiple jobs to provide for our family. Falling in love with the Giants via my transistor radio & a headphone… knowing in the deepest part of me that I knew Jesus Christ, & even more importantly, He knew me too. Through all of it, good & bad, joy & pain, I never really knew what to do with my feelings when they rose up, other than not being quick to get angry… (learned that from the Bible). So, I kinda just let them be, not realizing the impact that would have on my own life, but especially on my relationships with others. I kept people at a distance (physical & emotional). I rarely shared my real thoughts & feelings with others, & the few times I really risked, my over-correction/self-protection responses kicked in at the speed of a snapping resistance band that’d been stretched too far. This led to me being angry a lot of the time… or at least on the verge of being angry. Loved ones, esp. theBean, Pasty, iDoey, & theWeez, walked on egg-shells around me, never knowing what would make me ‘snap.’ And I never cried. So what changed when I hit 30? I came home from work & heard my oldest son say, “Dad’s home!” This was accompanied by the sound of little feet scampering… AWAY from the front door. They all ran to hide. In their rooms. I was crushed… & asked theBean if I was really as bad as it seemed I was… & she bravely answered my pop-the-lid-off-the-can-of-worms question truthfully. And hearing her answers, watching her tears, & seeing her pain (& fear) hurt worse than just about anything I’d ever been through… I hated this, & felt powerless to do anything about it. And then one day I was wrestling with a general feeling of “blah.” Like I was stuck in emotional quicksand, aware of the overwhelming-ness of being down in a hole with no real idea or ability to get out. I remember asking myself out loud, “WHAT is wrong with me?” And I got a response from the Holy Spirit… “You need to grieve the loss of your brother.” I had no idea what that meant. I thought I’d done that when he’d died 11 years earlier.. How was I supposed to grieve him again? And the tears started to flow. Like a summer rain, it started slow & then turned into a tempest. I was crying. Snotty-faced, out of control, can’t breathe, no sounds coming out/terrible anguish sounds coming out – Crying. The dam in my soul that had been there seemingly my whole life broke. And not just a little. It BLEW UP. And I cried. About everything. Nothing. It felt like I spent the next year crying, & I didn’t know how to make it stop. Chuck wisely said, “Well, maybe you’re just catching up on all the years you DIDN’T cry.” And he smiled when he said it. I don’t think any of my kids remember their dad who didn’t cry & who was pissed off most of the time. What they remember (& rehearse to the point that it’s an inside joke) is that I am a crier. I cry when I’m happy. I cry when I’m sad. I cry at movies. When I listen to really great music. I cry when I’m proud of them, & I cry when they hurt. TheWeez said she didn’t want me to do her wedding because, after all, “You’ll just be a crying mess. You can sit in the front row & do that.” She knows me :). And so I go back to Saturday, to the gender-reveal party… I had already cried at finding out they were pregnant. And in that moment right before the pink box was opened to let us know IT’S A BOY!, I felt the flood of emotion overcome me. By this point in my life, I have gotten more comfortable with my feelings & emotions, & its not a foregone conclusion anymore that I’m going to be a weepy & melty mess when it happens. I can remember thinking, “K.I.T. Keep It Together.” And I only cried a little bit. A couple tears, rolling down the face in a most-meaningful way. And we celebrated our soon-coming grandson. And a growing family. And I thought about the journey of emotional discovery, growth, & freedom of the last 16 years… & I’m so thankful for a God who wouldn’t leave me bottled up & broken, but who answered my prayers with people to help me. Musings on a Monday…the hog. I was in 3rd grade & it was Report Card day. I remember this because Report Card day was a Big Deal at my house, because it meant my parents got to see how I was doing in school… & not just the Academic grade, (which was, of course, important,) but also my Citizenship grade… which may have been the most important one to my parents. Well, as a 1st born over-achiever, I was already well on my way to developing my perfectionistic tendencies… & I had pretty well dominated all that 3rd grade could throw at me. I had A’s on top of A’s, & loads of extra credit. I remember distinctly my parents telling me that I’d done well & that they were proud of me. And, as a words of affirmation person, that was the only reward I wanted/needed, & was truly the only inspiration necessary for me to keep pursuing academic excellence. My parents had other ideas – I was laying on the floor of the living room of our house on Upson Lane watching TV… it must have been a good show, because I can remember hearing the muted roar of what was obviously some time of motorized scooter or bike, & not even turning around or looking to see what the noise was. After all, the sound was a pretty normal one for our house… for as long as I can remember, my dad has had motorcycles/dirt bikes, & pretty soon you learn to kind of tune out the sound. Not today. It got louder. Drew nearer. I even had to turn the TV up. Mine. My very own minibike. I put on a helmet & immediately rode it down Upson Lane into Margot Circle, thereby incurring the wrath of several homeowners who did NOT share the joy I was feeling & called the police on me to make sure that such boundless joy was muted & relegated to the appropriate places, namely, far away from them. I rode the minibike, my “hog,” every chance I got – soon after, we moved from Upson Lane to Golden Valley – its dirt roads, vacant lots, & general separation/distance from the City meant most of the world was my racetrack. It was joyous. I rode with friends, with neighbors, with my brother, by myself. I tried jumping it over puddles (& caught absolutely ZERO air.) The memories from a good portion of the next couple of years center on the hog. And then I grew up. Really, I don’t remember when I stopped riding the hog – it was probably when I realized that it only went about 25 mph… & it was so small. And I was more interested in baseball & football, & the unwritten rule was no motorbikes during the sports seasons. I think my brothers rode the hog too, but I can’t draw specific memories with them on it. I just knew that like many things from my childhood, my parents kept the hog in the garage with the thought that Someday they’d get it running again. For the grandkids. Over the last few months, I’d heard a couple of stories about the minibike’s restoration. My dad found a guy who fell in love with it & had been working on it. No other details. Then Friday, I was dispatched by theBean to go to Carson City to pick up a barstool that she’d commissioned my mom to get for her (it’s a long story, but it involves multiple visits to ROSS stores all over Reno/Sparks/Carson CIty.) I decided to turn it into a visit – to have some time to talk & have coffee with my mom in celebration of the impending Mothers’ Day. Near the end of my visit, my dad said, with a twinkle in his eye, “Want to see something?” We followed him into the garage & lo & behold! in the corner of the garage was the red Honda 50cc minibike… but instead of it being well-used, scratched up, & out of commission, it looked… good. Really good. I examined it closer & found that there had been a lot of work done. Engine. Gas lines. Other technical engine thing-ies. And then my dad started it. As soon as I heard the first roar of the engine I was transported back to being 9. I closed my eyes & listened to the engine purr & enjoyed the flood of memories that bombarded my mind. And then he asked, “Do you want to ride it?” As silly as it sounds, I hadn’t even considered it, but as soon as I knew I had the opportunity, I wanted to. I tentatively climbed aboard, (one doesn’t just cavalierly mount a Honda 50,) & re-familiarized myself with the gears, hand & foot brakes… & I took off down the driveway. Next thing I knew, tears were streaming down my face, whipped & dried by the wind. 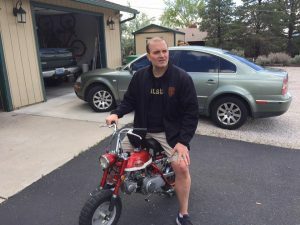 I don’t know what happened, but riding that minibike for those 10 minutes did something in my heart & I felt a joy that was so foreign yet familiar that I almost didn’t recognize it… a leftover from days where I used to do things Just Because they were Fun. What happened to that boy? I miss him. When I went to get dressed this morning, I couldn’t find my pants. So, I did what we most like were all taught to do: think. Where was the last time you had your ______? That tactic usually works… except with my pants, I was pretty sure I knew where my pants were, because, hey, I don’t normally take my pants off until I get into the privacy of my own room. It’s a thing. So then I had to ask myself the question: Is there any other place I could have taken my pants off? I have to say I couldn’t think of ANYWHERE I could have… & then I was sad. REALLY sad. Those were my pants, the pants that I liked, the pants that fit me. It is hard to find pants that fit, & those really did. I went to the gym last night after work, & I hadn’t had time to change into my gym clothes before I left work (normally I change before I leave work. It’s a thing. But I digress). Maybe I left my pants in the locker at the gym. With no lock on the locker. NOTE: I know it’s probably not a good thing to rely solely on a presumed Mens’ Locker room etiquette or code that no one would touch my pants (& my black Under Armour polo! ), but its been working for me so far. However, I’d never stretched the limits of this “Mens’ Locker Room Code” overnight. So hoping beyond hope, I called the gym & asked if someone would check to see if my pants were still in the locker I used; left the guessed locker number, my name & number & waited for a call back. Figured it would take about 5 minutes or so. I waited 10 & decided to go check the locker room myself. Arrived at the gym 10 minutes later, identified myself as the caller who may have left his pants overnight in a locker. The girl at the front desk said, “My manager was just in there & couldn’t find anything.” Wonderful. But I wouldn’t believe it until I checked. Over the years, I have learned that when something doesn’t belong to someone, they aren’t nearly as diligent in looking for lost things as is the individual who lost it. Those were my pants, & if they were in the locker room, I would find them. I went to the locker number I had guessed & BOOM! There were my pants, still hanging majestically on the hook where I’d left them the night before. A flood of joy WAY too big for the occasion poured over me. I was giddy. Laughed out loud & danced a little jig. The melancholy was gone as quickly as it had come, & a joy replaced it. I walked from the locker room, pants held high all the way out the front door. The girl at the front desk clapped for me & cheered, “Yay!” (Evidently she values pants nearly as much as I do.) The manager who “looked” for my pants didn’t meet my victorious gaze as I walked to my car. This was going to be a good day. I sat down in my car getting ready to head to work & I heard God say, “You know how happy you are because you found your pants? Think how happy I get when a person who’s lost turns back to Me.” Made me cry happy tears. Not for my pants, but for a God who could use something as trivial as my pants to remind me how valuable each one of us is to Him. For more on what God thinks about people turning to Him, check out Luke 15. Ramblings from my head – from January 22, 2016, the day that would have been John Leavy Locke’s 43rd birthday. But it happened. Johnny grew up. And we DID become best friends – we spent our childhood playing baseball & football from dawn til dusk in the backyard. One of my favorite things was to teach Johnny how to do something – we had a baseball tee in the backyard, & he was trying to hit the ball off the tee, without success. He said, “Help me Louie! ?” And I did. And I loved it. Sometimes the games carried into the house, with the predictable destructive results to the house – & also to Johnny – I remember trying to teach him what form tackling was in the living room. I was on my knees to make it fair – & he ran the football towards the end zone (aka the fireplace) & I launched myself at him & sent him sprawling. I was so proud of my form tackle that I didn’t notice him get up & run as fast as he could to the back of the house. I yelled at him, “Come back here you chicken. You have to tackle me now.” He didn’t come back… turns out when he fell he hit his forearm on a screw sticking out of an open door – & his forearm was sliced open, clean as a whistle, no blood at all, from his wrist to his elbow. Good times. The older we got, the better friends we became…And the more intense our fights got. I’d wake him up in the morning & he’d welcome me with a baseball aimed at my head. We’d wrestle & somehow I’d end up with a bloody nose because Johnny had ‘accidentally” kneed or elbowed me in the face… again. Our conversations shifted towards topics fitting our teen years… Sports. Girls. Music. His interest in “New Wave” fashion – he was a fashion-ista & rocked board shorts, surfer t-shirt & black/white/red Air Jordans as easily as he did cool pegged jeans, top-siders, & pastel button ups. Goodness, he was confident – so sure of himself, much more so than I ever was. I appreciated his strength, his sarcasm, his ability to show compassion, his loyalty, as well as the killer instinct on a football/baseball field. He was my best friend. The memories whirl around me like I’m in the eye of a hurricane, & they’re flying around me, so vividly faint that I feel overcome… & I don’t want them to stop. When Johnny was diagnosed with non-Hodgkins lymphoma, everything in our family got turned upside down. My strong, independent brother became fragile & dependent on others for the most basic of tasks. He spent quite a bit of his last months in San Francisco receiving experimental treatments in the hope that his body would rebound. I didn’t know how to deal with the hurt, pain, grief, & other negative emotions I felt, so I did what I knew: I poured myself into work, hoping beyond hope that when I finally lifted my nose off the grindstone, everything would be back to normal. It never happened. And through it all, I watched my little brother Johnny grow as he experienced the closeness of a God who would never leave or forsake him, even when he was walking through the Valley of the shadow of death. In many ways, my faith in Christ had been theoretical – never before tested; then, right in front of my eyes, I got to see what it looked like to persevere in the face of adversity, to find joy & peace in times of despair & chaos. I got to see & hear the response of a 17 year old who was asked, “So, do you want to die in the hospital or at home?” He said, “I’m going home. And if I die, I will bring God glory. And if I live, I will bring Him glory. Either way, I win.” And he meant it. In his last days, Johnny received assurances from heaven in the form of dreams. He didn’t go into a whole lot of detail about them, but there was a calm, a peace, a sort of anticipation present in his eyes & his countenance. He was in & out of consciousness quite a bit – one of the last things he said to my parents was, “Have faith. Have faith.” And he meant it. Within this last year, my two sons have gotten married; myWeez, my little princess, got engaged. So many things like this I wish I could share with my brother. So many things I wish my kids would have gotten to know about him, & having him involved in their lives. I feel like his physcial presence would more readily explain the passion with which my son Johnny attacks life; the fiercely compassionate temperament of my son Joey; the wit, sense of humor, & smile of theWeez. They’re a lot like him & don’t even know it. I see Johnny in each of them, & I’m so glad that these parts of Johnny living on into the next generation. Yesterday I had the privilege of sitting with dear friends, a couple that’s been married over 50 years. The wife is recovering from cancer surgery… recovering well. We’ve believed for a good prognosis & post-surgery update. It turns out the doctor’s report said the cancer they went in to get was “got…” but… There were other cancer cells that they found somewhere else. And they weren’t contained. And the doctors were in the process of putting together a plan of attack, a plan for treatment. The room swam in front of us. My friends are faith-filled. Hopeful. Tired. Sad. The whole gamut of emotions. Wanting to hear what the doctors will say, & at the same time knowing that the doctor’s prognosis isn’t the final word. I had a flashback. Cancer. My brother Johnny – he had an (at the time) experimental treatment in the attempt to eradicate the non-Hodgkin’s lymphoma that had ravaged his body… the bone marrow transplant. I remember hearing the all-too-simple sum up of what this procedure entailed: 1st, the docs harvest the bone marrow from the hip; 2nd they bombard him with enough chemo to kill the cancer & hopefully not him; 3rd, they reintroduce the bone marrow & hope that it acts like a ‘reset button’ allowing him to recover & heal, sans the cancer. Post-procedure, the news came in… it didn’t work. And there were more cancer cells, in other places. Not contained. One nurse callously asked him, “So, you want to die here or at home?” I could’ve punched her. That was the same general feeling/spirit in my office yesterday – no matter what, we will hold onto the fact that God is in charge, & that He is the one with the final say on our lives & when we go home to be with Him. And in the meantime, we will live with determination, persevering in our trust in Christ. With the knowledge that this faith in Christ really shines in the midst of our difficult times. He’s our Rock. Fortress. Deliverer. Healer. Salvation. The One who is with us, even as we walk through the valley of the shadow of death. This morning I observed the normal hustle & bustle of our start to the week – thePastyGangster dropped Mason on his way to work so that Auntie Weezie could take him to preschool. He entered the kitchen in a whirlwind of energy & didn’t slow down. Frank came bounding down the stairs so theBean could take him to school… then rushed back upstairs at least 2 more times because he forgot something. (For such a little guy he sure makes a lot of noise.) iDoey was up & at ’em making breakfast… everyone was headed in different directions at 100 m.p.h. Still, it was a good morning. The flurry of activity common to our weekday mornings stands in stark contrast to our Sunday afternoons/evenings. The afternoons are peaceful, quiet, & restful, with only the occasional football game related noise (cries of anguish for 49er fans like me,) breaking the silence It’s a time for rest, catching up on a good book, eating a favorite snack, or just hanging out. The evenings we gather around the dinner table (or counter,) usually with family & friends for a good meal, even better discussion, & time together to be savored. I love it. Enter by the narrow gate. For the gate is wide & the way is easy that leads to destruction, & those who enter by it are many. For the gate is narrow & the way is hard that leads to life, & those who find it are few. I have been on a ‘soup’ kick for the last few months. Seems like I just can’t get enough. My current favorite is made with grilled onions & garlic, cumin, green chiles, diced jalapenos, black & white beans, chicken stock, & the meat of a Costco rotisserie chicken. Lots of flavor & a little bit of spice. I think I’ve been eating it an average of 2x/day. Just signed up to be a part of a spiritual direction program for the next 9 months. It’s a 1x/month meeting via Skype & I have no idea what to expect, except that I am expecting good things. I’m convinced that whatever you look for in somebody, you’ll find. If you’re looking for the good, for the areas that God is at work in & through, you’ll be able to uncover it, even if it’s small. And if you look for the negative, the bad, the ugly part of us that everyone has, you’ll find that too. On that note, there’s always something in life to be complaining about, but really? Why? Why complain about life circumstances, another person who isn’t meeting your expectations about how they’re living their life, etc… ? It doesn’t help, & it makes it not very fun to be around you. Trust me. I’ve been that guy – & one of the best days of my life was when someone told me, “You are SO negative, & you complain about SO many things. It’s tiresome.” I was forced to look in the mirror of my soul & I found a lot of discontent – stuff that was for me to address about myself… & the complaining & negativity were just symptoms, a distraction maybe, that oriented me towards living as a pessimist/realist/negative Nancy. a real downer who was very critical of myself & others. No fun. Don’t want to go back to that. Here’s to a great day. In the middle of life’s busyness & hectic pace, have you ever had the thought, “I wish I was on a quiet beach somewhere with no noise, no demands. Just the sun, a good book, & a loved one? THAT is where I’ll finally be able to get rest.” I have… & I’ve been thinking more & more about what theBean & I going to do on our sabbatical when this quiet beach becomes our reality. But I know me. It will do me no good at all to get away for 8 weeks, no matter how incredible the beach is or how isolated, quiet, & perfect the surroundings if I don’t REST. In my head… you know, find the relief, the mental & emotional tranquility that brings a refreshment to the depths of your soul. I know that the last thing I want to do is be laying on beach next to theBean, all the while going 100 miles an hour in my brain, preoccupied, distracted, worried, & stressed. …there remains a Sabbath rest for the people of God, for whoever has entered God’s rest has also rested from his works as God did from His. Let us therefore strive to enter that rest, so that no one may fall by the same sort of disobedience. For the word of God is living & active, sharper than any two-edged sword, piercing to the division of soul & of spirit, of joints & of marrow, & discerning the thoughts & intentions of the heart. And no creature is hidden from His sight, but all are naked & exposed to the eyes of Him to whom we must give account. As I’ve been pondering the question, “What do I have to do to enter God’s rest & to really experience the Sabbath rest this talks about?”, I keep coming back to verses 12 & 13 above. You know, the part about the power of the word of God – & its ability to cut through to the very core of our being, even weighing our thoughts, motives, & intents of our heart… & it makes me think that entering God’s rest (& finding true rest for my soul) is tied to time with Jesus… meditating on His words… allowing Scripture take root deep in my heart. Because it doesn’t seem to be about doing something – its about transformation of heart & mind… not striving… learning to BE & BE dependent on His word. That’s my goal. That’s how I want to be becoming, more & more. And I’m gonna find rest. Think about it. The final ‘act’ of creation was God creating Sabbath, Holy Time –This was so important that He built it into the fabric of creation by working six days, then on the seventh day, He STOPPED. And then He RESTED. When we have time off, we use it to get everything done that we couldn’t finish during the work week, &/or we pack our free time with all sorts of activities. Technology doesn’t help us out here – the modern conveniences of ‘staying connected’ through our smart-phones, computers, omni-present wifi, mp3 players keeps a constant barrage of stimulation & noise bouncing around our brains. No wonder silence seems strange. Do I ever REALLY stop? When was the last time I took a day, set apart as Holy Time, & didn’t work… didn’t get preoccupied/distracted with something… just intentionally set myself up to BE? The defense mechanisms kick in quickly. Countless reasons for WHY I do what I do, & WHY taking much time (let alone a day) is just about impossible with all the things that fill my busy schedule come to mind. And then I think about what I read last week from Matthew 11:25-30, especially the part about finding God’s rhythms of grace for life… & I contrast that to the driven, life-sucking pace & practices that lurk around me… And I want that rhythm, God’s rhythm for me. And so I invite Him in to the mess of me… & I trust He will FINISH what He starts. At Hillside, we just finished up our most recent series, “Who am I REALLY?” (You can listen HERE & HERE if you’re interested.) It was an exploration of WHO God says we are, in Him, & WHAT the ramifications of that are in our lives. I really enjoyed it, & got to hear lots of feedback from others on the things that they were learning & hearing from God as He did work in helping them grow in Him. And when one’s supervisor says such things, you does them. BTW: Here’s a SUM UP of what a sabbatical is (it’s wikipedia – don’t sue me:) – & here’s some INFO on why sabbaticals are helpful to pastors: – & here’s MORE. This might sound to you like a no-brainer – if the pastor’s going to be gone for several weeks, wouldn’t it be a good idea to talk quite a bit about it & to prepare the community for it as well? I would say, “Yes. Yes it does.” And, to be fair, I have talked about it. A little. And so I repented. Asked God for forgiveness for getting caught up in the speed & race of life. And for dis-remembering what it means to live life at God’s unforced rhythm of grace. Cause a sabbath (& a sabbatical) are not just meant to be a recovery time so that we can jump back, helter-skelter, into the out of control mess of life. Rather, they are to form a pattern for how life is lived the rest of the week/month/year, etc… a life lived at God’s pace, with His values, purposes, & goals directing every step. It’s counter-intuitive to the world-system (& even church-system) & requires both LEARNING to walk at God’s pace & REMAINING dependent upon Him for what comes next… Here we go!